Lunch with my sister in Kagurazaka district, which is my old “hood”. Kagurazaka has an unique ambience of old-school Japan and French culture. 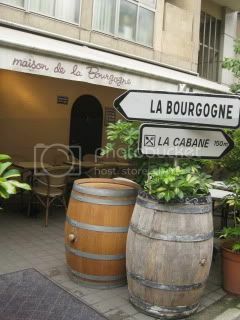 Kagurazaka has the highest concentration of French restaurants in Japan. 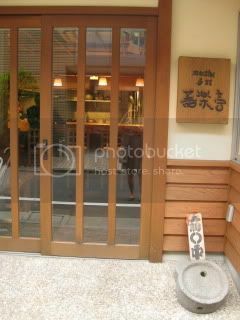 We went to a soba restaurant, Kyorakutei, which is a short walk from Kagurazaka’s main street. 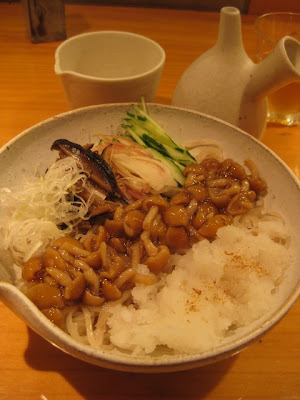 They serve handmade soba and hiyamugi noodles. I had handmade hiyamugi, topped with nameko mushroom, grated daikon, etc. The noodle was at its perfection. It was so shiny and almost translucent with nice smooth texture. 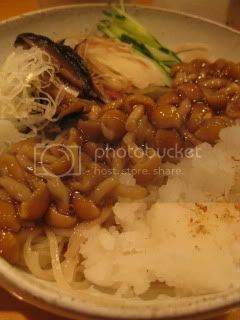 One of the best hiyamugi noodles I’ve had! Anago and vegetable tempura was nice, too.